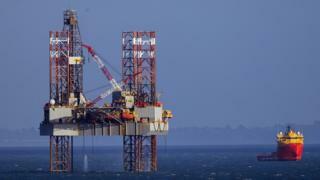 An exploratory oil rig has left the Dorset coast after finding "potentially substantial" reserves. Energy firm Corallian began work on an area known as the Colter Prospect in Poole Bay in February. It previously said it had missed its drilling target area, but unexpectedly hit extensive reserves of oil nearby. An environmental group said any full-scale extraction would pose a "tremendous economic risk" to local beaches from possible oil spills. Corallian's partner firm, United Oil and Gas, said the discovery of the new reserve - which has been named Colter South - was a "fantastic result". It said an estimated 15 million barrels of oil was recoverable from the new area. Chief executive Brian Larking said: "Anything north of four million barrels of oil recoverable would be quite a huge success for our shareholders." He said the results were being evaluated, while "encouraging" signs of reserves in a third area were being followed up. Corallian previously said the original Colter Prospect was smaller than first thought. If oil can be economically produced, Corallian proposes to extract it by drilling horizontally from the shore. However, such a scheme would require a separate licence. Campaigner Sara Pascoe, from Save Our Shores, said "This is just the start and they're coming back. We're going to continue fighting it. "It is ludicrous to take a tremendous economic risk with our award-winning beaches. "And it's frightening that the government is supporting drilling for offshore oil in view of climate change."